In my youth, I avoided any kind of red sauce, be it on pizza, pasta or pancakes. Don’t ask. I’m sure somebody out there loves to top their pancakes with cooked tomatoes. Now that I know how to make my own, I can’t get enough of it! What is my trick to a rich and hearty tomato sauce? A long cook time. I start out by combining the diced tomatoes, tomato paste and bottle of wine in a large heavy duty stock pot over medium heat. Allow the tomato and wine to simmer for a couple of hours. Go ahead and sauté your diced onion in a bit of olive oil and sprinkle with salt. You will probably want to do this in 2 batches in order to properly brown the onions for a delicious caramelized taste. After a few minutes of sautéing the onions, add the garlic, and continue to cook until the onion is slightly translucent. If the bottom of your pan has any browning, deglaze with a splash of liquid. Wine, water, or stock will do. To deglaze the pan, keep it over the heat, add cool liquid and immediately scrape the bottom of the pan. Add onions and garlic to the tomato sauce. Place chunks of ground beef in your sauté pan over medium-high heat. Sprinkle with that magic fairy dust you probably know by its common name of salt. Cook until the meat is browned but not burnt, deglaze with Worcestershire sauce, then add to the tomato sauce. Add the herbs and adjust seasoning accordingly. 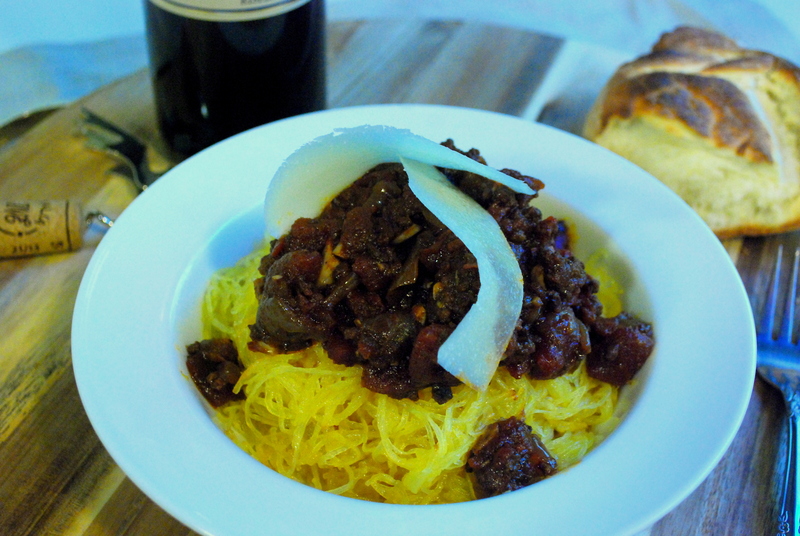 Serve over spaghetti noodles or spaghetti squash for a wonderful gluten-free option. Shave a few slices of any hard cheese over the top. Parmesan, Romano, Asiago, or Manchego are all good bets. Be sure to invite a few friends over because spaghetti tastes best shared with good company.